The growth of communities required more firefighting capacity in the late 1800’s. 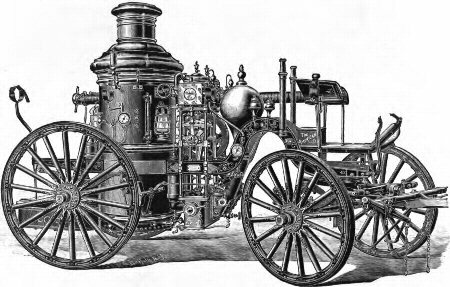 Technological improvements led to the common use of steam-powered pumpers in cities and towns across Canada. The steamers could provide large volumes of water at substantial pressure. 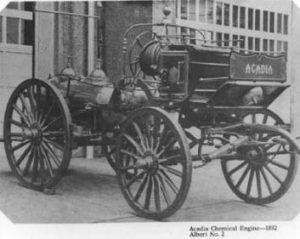 The apparatus greatly out-performed hand engines and allowed fire fighters to concentrate on rescues, fire attack, etc. Much heavier apparatus required the use of horses to move the machines to the scene quickly. Once at the scene of a working fire, the horses were unhitched and led away from the area. This fire crew from the early 1900’s had to make do with a primitive hose-reel. Their protective clothing would fend off water, not much else. Tradition has it that firefighters, like the one on the right, would soak their beards in water before entering a blaze, and even stuff their beards in their mouths to help with breathing! In larger centres, the horses were stabled at the rear of the fire hall. At the sound of the alarm, the well-trained animals would move to their places in front of the rigs, and special harnesses suspended from the ceiling were lowered and attached, making for a fast exit from the hall. In smaller communities it was common for cartage operators to rush their teams to the hall when the alarm sounded, hoping to arrive early enough to be of service for a $5 fee. 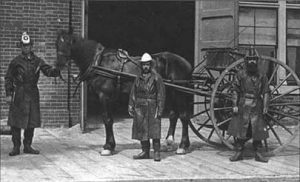 Horses were always held in high regard for their role in the fire brigade and stories of their character, service and loyalty persisted long after the horses were replaced by motor apparatus. During this period, aerial ladder trucks were developed for the fire service, employing a 2 section wooden ladder. Sizes available: 55, 65, 75, and 85 feet. Ladders were elevated by a worm gear, or by a spring loaded device assisted by hand cranking. Hand wheels extended the ladder and rotated the turntable. Relatively rare in Canada were water towers. Montreal and Toronto used them to provide high-level streams for major fires in upper level commercial area buildings. The Museum has a selection of hose-drawn apparatus including hose wagon, hose reels, ladder carrier and hand pumper.